Quite a few years ago, my wife and I experienced a real life example of this week's focus Bible verse. A good friend of ours was speaking at a big conference and we went to see him. Since we arrived just before the meeting was about to begin, the only seats that were available were near the back of the auditorium. Though there were a few different places that we could have chosen to sit, in my heart, I felt prompted to choose the absolutely furthest two seats from the stage. We were happy to sit there and didn't think much of it. A few minutes later, a man showed up and escorted us to the front row where two seats were waiting for us. Apparently my friend had asked the church staff to look out for us and make sure that we had primo seats for the meeting. The funny thing was, because of our close proximity to the stage, one of the cameras broadcasting on the big screen and live on the web was pointed on us from time to time. If we read this story from an orphan based mentality, it may reaffirm a twisted mindset of what servanthood is all about. If we don't see it through the lens of love, we may interpret what Jesus is saying something like this... Because you have little value to God, don't think too highly of yourself either. If you read this parable from that perspective, you will continually look for opportunities to reaffirm that belief. Instead of seeing yourself as a greatly loved son or daughter to the Father, you will settle for a lowly servanthood where you seek to establish your identity through your service. It is true that sons do make the best servants (Matthew 23:11) but it is not our service that qualifies us for sonship! The more that we know that we are loved by God, the less we will have to reaffirm our insecurities through counterfeit expressions of servitude. The more that we live in love, the less we will look for ways to justify our place in Papa's house. When the love of the Godhead begins to ruin us for anything else, we will begin to see that true humility is not about us thinking less of ourselves but rather thinking of ourselves less! 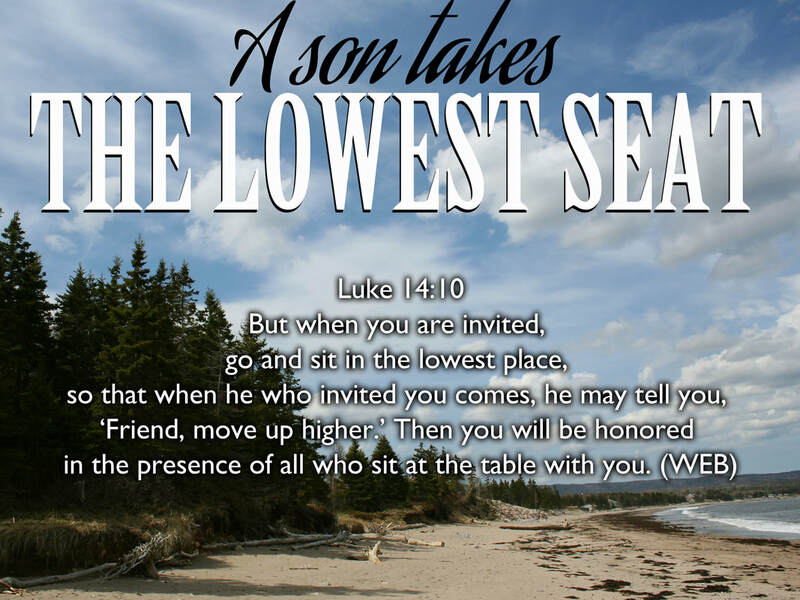 As a result, we do not have to be on the lookout at every occasion to take the biggest, best, most honored seat in the house because we are happy to take the lowest seat and leave the chair of honor for someone else. If someone comes to us and invites us to the chair of honor, great! If not, no problem because it really isn't important anyway. As long as it is important to us, there might be something of an orphan mindset lingering that Papa still wants to love out of us. My prayer today is that we would all be so filled with the revelation of God's everlasting love for us, that where we sit would become inconsequential. I pray that our identity and self worth would no longer rise and fall by the affirmation of man. I pray that we would not need to be affirmed, recognized and validated as being worthy of the seat of honor because we have been affirmed, recognized and validated by the One whose opinion of us really matters (and that is Almighty God! ).